Rather than attempting to force the Vaughan Williams Sonata into a Brahmsian rhetorical mould, Rupert Marshall-Luck and Matthew Rickard enter fully into its remote sound world of half-spoken gestures and Holstian cool. ... Marshall-Luck proves highly responsive to the music’s expressive ebb and flow, as does his devoted accompanist Rickard, who negotiates these demanding scores with aplomb. [Marshall-Luck and Rickard] find plenty of freedom in the fantasia shaping of the music [of the Vaughan-Williams Sonata], bringing requisite tautness to the scherzo. They also explore the variations in the finale with surety and a good sense of direction. ... The performances are committed and watertight of ensemble, and the notes are first class. 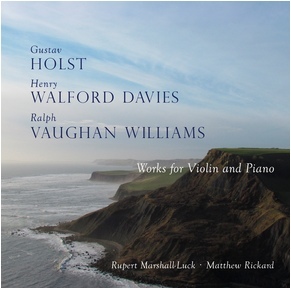 Marshall-Luck and Rickard capture [the Walford Davies’] quintessential Englishness beautifully. ... [This disc is] a perfectly pitched representation of a particular genre. ... Buy it for the decorous playing and absolute purity of origins. There is no doubting Rupert Marshall-Luck’s commitment to the cause. He addresses the needs of each composer and each movement ... and has in Matthew Rickard an adept and sympathetic accompanist. On this recital disc Rupert Marshall-Luck and Matthew Rickard concentrate on communicating the music without any idiosyncratic or intrusive exaggeration. This high calibre partnership speaks of sanguine spontaneity and a natural warmth and affinity for the music. I was impressed with Marshall-Luck’s appealing timbre and Rickard has a fine sense of keyboard colour. Recorded earlier this year the sound has splendid presence, clarity and balance. The key work here is Vaughan Williams’ late masterpiece; not a stranger to disc, his sonata here finds a warm and flexible performance. Holst’s early five pieces are charming and mostly new to disc, as in the Brahmsian sonata by Henry Walford Davies. If you are viewing this page on a device such as an iPad, and are unable to see the media player on the left, then click here to hear some audio.